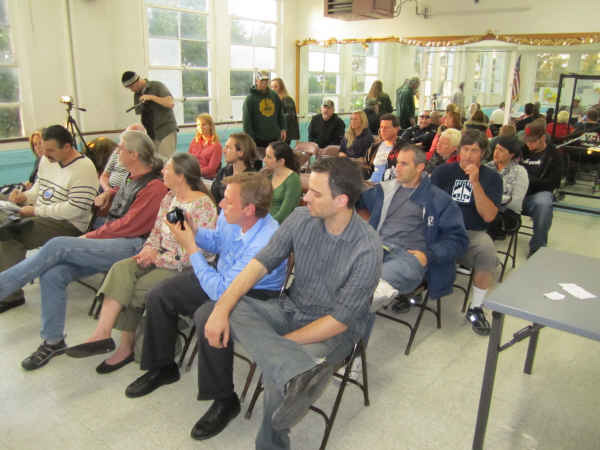 Last night, Wednesday March 16th, the Ocean Beach Planning Board voted against the current proposed ordinance on Medical Marijuana dispensaries. By a vote of 6 to 1, the Board in a Special Meeting voted against the measure because of its overly stringent restrictions. They in essence agreed with critics of the ordinance, some of whom assert that the measure would effectively ban all dispensaries in OB and throughout most of San Diego. The ordinance is expected to go before the full San Diego City Council on March 28th. 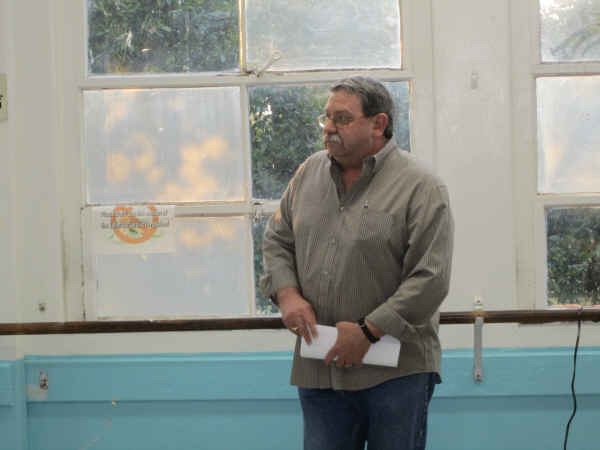 In front of nearly a full-house at the OB Rec Center, the Board listened to close to a dozen speakers – all but one spoke out against the ordinance -, and then offered their own opinions before the vote. Medical marijuana activists and local residents filled the meeting room, and applauded those speaking out against the measure. The round of public comments began with OBcian Dave Martin, who addressed the Board as a member of the original Medical Marijuana Task Force. Martin supported the original recommendations of that Task Force, which only included 500 foot distances from a dispensary to various institutions, such as schools. He felt the new proposal was more stringent, as it requires a 1,000 foot distance. Vice-chair Landry Watson clarified that the Alcohol Beverage Control agency only requires 100 to 500 foot distances for liquor stores. At the 500 foot range, the burden of proof is on the community to show that the applicant for a liquor store is improper, whereas within the 100 foot range, the burden of proof is on the applicant, Watson explained. Dave Martin addresses the Board as a former member of the Medical Marijuana Task Force. Martin reitereated that churches and parks were not included in the original Task Force recommendations, but they were added into the new proposal going before the City Council. The Task Force has since been disbanded, and never did meet to discuss the new proposal, he said. Next, people from the audience spoke out. Vivian McCardle spoke of the need for safe access to dispensaries for those who have medical problems. Eugene Davidovich, representing Americans for Safe Access and the Stop the Ban group, said the proposed ordinance is an effective ban on such dispensaries, asserting that it would close one hundred San Diegan businesses. He added that state law only requires a 600 foot range. When it was my turn to speak, I offered only two points: as a lawyer I stated that I believe that the ordinance is illegal and will be challenged in court, that the City will spend our money defending a losing battle to defend it if it becomes official. And secondly, I said, the Board is the voice of Ocean Beach and that it needed to represent and reflect the community, adding that during last fall’s election, precincts in OB had some of the highest vote percentages in favor of Prop 19 – the legalization measure. A couple of other speakers cited that the ordinance did not address deliveries. One local resident, Barry Sweet, told the Board that he was a medical marijuana patient and member of the Task Force, and that without cannabis he would have died ten years ago. Sweet said that the City Council had been unduly pressured to drop the original Task Force recommendations, and that the City needed to get back to the original measure. He said he believed the current proposal was “an abomination,” and that if passed, the ordinance would force out everyone except those “big guys” with the ability to raise $400,000 to start up a dispensary. Glen Franks spoke next. He represented Second Chances, a homeless advocacy group, and listed a number of reasons they were in favor of the ordinance: “it’s called dope for a reason,” he said, “drugs make a punk out of a hero,” and that “you can’t negotiate with terrorists,” meaning that drug addicts commit crimes to further their habits. Mrs. Sweet – the spouse of the patient spoke. She told the Board that she is an educator in San Diego schools and a Girl School leader. She emphasized that we needed to separate out medical marijuana from drug abuse per se, that alcohol is sold on every main street in the community, and that she and her Girl Scouts while selling cookies in front of Rite-Aid, watched more beer coming out of the store than they sold cookies. “Alcohol kills more people than marijuana,” she said. One young speaker cried while getting out the points that school kids are falsely educated about marijuana, and that it is not a dangerous substance. Others spoke against the measure, including our own Dan Morales. Board members give their views. From left to right, Seth Connolly, Scott Thekalsen, Craig Klein, Landry Watson, and Chair Giovanni Ingolia. Finally, it came time for the Board members themselves to offer their thoughts and opinions. Seth Connolly cited how easy it was to obtain medical marijuana documents, that there is definitely a “black market” in the drug, and there was a need for regulation. He agreed with my point that the ordinance if passed would end up in a courtroom, and he did not support the present measure. He did agree with adding a Process Four procedure to the original Task Force recommendation. A Process Four would require applicants to come before the Planning Board. Board member Scott Therkalsen said he was strongly against the ordinance, that OB precincts voted heavily for legalization, and that “it’s pretty clear,” he added, “that the City is attempting to zone it out.” Let’s go back to the original Task Force recommendations, he said. Therkalsen was the member who had originally asked that the Board hold a special meeting on the proposed ordinance. Craig Klein came next. He offered – in defending the ordinance – that the state statute passed in 1996 only talked about non-profits, and that it did not speak about “storefronts”. Many current dispensaries, he said, are making lots of money. The only thing he wanted to add to the current measure was to expand the types of locations where dispensaries could operate. “One per zip code,” he said. Brittany Taylor, past chair, reconfirmed her support for the Task Force recommendations, and also wanted a Process Four added. Jane Gawronski was next, and said, “We did support the Medical Marijuana Task Force,” and like other members, wanted the Process Four added. It was also then clarified that a Process 4 would require applicants to come before the Board for their approval, whereas a Process 5 would take applicants directly to the City Council. The Board then took a few moments in figuring out their motion. It finally was formulated as a vote for the original Task Force recommendations, with the addition of requiring a Process Four, not to allow on-site consults, and that deliveries be in accordance with State law. This motion passed 6 to 1, with all but Klein in favor. The Board in this vote, clearly made their stand against the proposed ordinance because it was too restrictive, and not in line with the original Task Force proposals. As this was the only agenda item for the Special Meeting, it was over. Just before people started to file out, Community Relations Officer Dave Surwilo thanked the crowd for being mature, democratic, and not putting down the lone speaker who was against the tenor of the audience. He also received a round of applause. The Planning Board’s vote will be forwarded to the City and Councilmember Faulconer’s office. Hopefully, the full Council will see the writing on the wall clearly outlined for them by the OB Planners, and reject this current ordinance. Good on the OBPB, I believe they made the correct decision. Chris, perhaps it’s time to start flooding Councilmember Faulconer’s office with letters, emails and calls. His office: 619-236-6622. Register your feelings. Who voted for who voted against ? It just came up ignore the question…memory lapse…. Thank you to those who spoke up against the new ordinance when I couldn’t. I’m at home recovering from hip replacement surgery, and if it wasn’t for my medical marijuana, this whole ordeal would have been a lot worse. Would have loved to be there. Zone it out.One per zip.Terrorists. Sounds like it’s time saddla the Lawyer up. At least the Girls of Ms.Sweet and the other young person give us some hope for the future. If I was still in that burg I’d advocate for a return to the Underground plan.As long as you had your card and weren’t holding over the limit,you could do what ever you are brave enough to do. 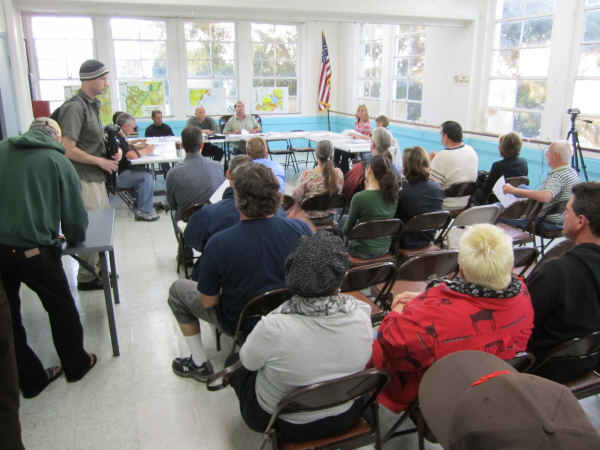 I want to thank the Ocean Beach Community planning board for holding a special public meeting regarding Medical Marijuana. You have clearly done your homework on such an ever changing issue facing our unique community. A variety of voices wear heard with a very similar opinion; Medical Marijuana should not be so restrictive that it will negatively affect so many positive aspects in our community and city. This was a wonderful opportunity for everyone to come and voice their opinions. Not a surprise at all to see that Rep. Klein was the dissenter, he has been consistently vocal about more stringent regulations on alcohol (beach ban) in the past. During previous discussions of the MM issue he was insistent on additional sensitivity issues in addition to the Task Force recommendations but those were voted back by the OBPB. I wonder what postion he will be in when a member of the OBMA decides to open a Dispensary? And yes Mr. Klein, they ARE making money – that is why there are currently 8 of them in OB and only one Rite Aid. There is probably one on your street good sir – or one that will deliver directly to you if you request. We need a level of public oversight on these NON-profit organizations dedicated to the distribution of a Class 1 narcotic for the medicinal use of those who TRULY need it. And also a method and vehicle for recourse if the community doesn’t feel these “missions of mercy” aren’t keeping up their end of the bargain. In fact, I welcome the future institution of these measures so that the OBPB can review them one-at-a-time and ensure they are operating in compliance so that there is NO future risk of blocking this medical option for those who can truly benefit from it. I applaud this action of the Planning Board for putting together a meeting in time to get their recommendations heard by City Council before they possibly take action on it next month. Specifically, thanks goes out to Representative Therkalsen for insisting on the item be discussed as it was previously scuttled by Rep. B. Taylor for “not enough information” to be voted on at a previous meeting. Chairman Ingolia was wise to see this issue and to call for the executive order of a special meeting in order to voice the position of OB. Well done Planning Board – even if you were only barely a quorum last night. How is THAT for celebrating….Dr. Lanos? And everyone, be sure to vote AGAINST Bonnie Dumanis for Mayor when the elections come up. She is the City DA who closed all the dispensaries in SD in ’06! Well i think its about time the city shuts down these shops for good. Safe access right..how about unsafe drugs access to children. NOT IN MY CITY! So do you want to shut down the Rite Aid and the liquor stores too? No one can just walk in to one of these dispensaries and buy drugs, least of all kids. In order to be allowed in the door you have to produce ID, your medical marijuana card and they call your doctor to make sure you are legit. It’s easier for a child to get alcohol or cigarettes than weed from one of these stores. Show me one case that supports your claim. Not kids, per se, but essentially *anyone* over the age of 18 can go get a cannabis card from one of several “420 doctors” in the area by walking in the door and filling out a short form in which they claim to be suffering from anxiety or depression. In and out the door in less than half an hour. You almost certainly will not get turned down. You can then take that card to any number of area dispensaries in OB, and get your bud on. This entire industry is almost completely unregulated at the moment, unlike liquor stores, and also unlike pharmacies, who will at least make you go to a real doctor before issuing you prescription medicine. And make no mistake that this is in fact an industry, whose primary intent is to make money, from selling both cannabis cards and marijuana itself, rather than some altruistic non-profits selflessly serving the select group of people who do in fact benefit from their services for medical purposes. I support decriminalization and even the legalization of marijuana, but it seems clear to me that medicinal marijuana has been used as a trojan horse for those separate and distinct issues. That’s fine, but let’s just call it what it is and not pretend that most of these businesses are not profiting primarily off of exploiting a legal loophole that currently exists on the state and municipal levels. In any event, as far as OB goes, my bigger concern here is a lot more narrow, and focused on the land use impacts of medicinal marijuana dispensaries in our neighborhood. Traffic, parking, public safety and effect on local businesses and community character. In other words, the exact same standards I would apply to liquor stores, pharmacies or any other type of business or development. Stripped down to that level, the issue is a little more simplified. What types of local regulation are required, and are the regulations effective and fair? Meeting attendees did a *great* job of approaching the issue in those terms the other night, in my opinion. There is obviously plenty of room for debate even within this narrow context, and many eloquent points were raised. Speaking for only myself, I think it is both necessary and fair that medicinal marijuana dispensaries are regulated on much the same level as liquor stores, pharmacies and health clinics. A health clinic passing out Oxycontin prescriptions to anyone claiming anxiety or depression would get shut down. 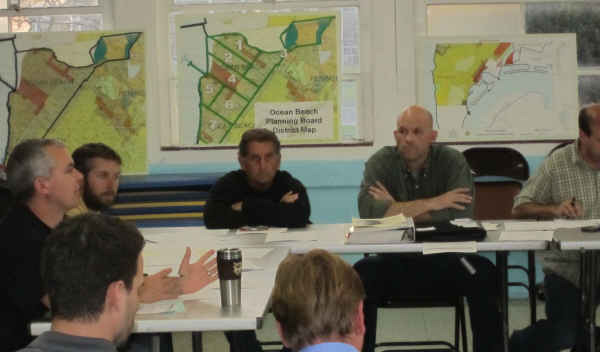 A liquor store in OB has to come before the community to make their case for a license, and is subject to similar buffer zones from schools as were proposed by the Medicinal Marijuana Task Force. Also speaking only for myself, it would seem that there is room within OB for a couple of well-run medicinal marijuana dispensaries, that are subject to initial review by the community, and regulation from the appropriate agencies. I also have seen them let people in their dispensary’s with fake medical cards. Everyone know this but no one cares….NOT IN MY CITY!!! no way now how..
jon – IT’s the law. Get on board, stop living in the past. I challenge you to prove that “everyone knows this” and that dispensaries “let people in… with fake medical cards,” because you cannot. Your rant “not in my city” is inappropriate and demeaning to the overwhelming members of this society who believe medical MJ should be available and to the millions of us who voted to outright legalize it. Jon…really, you are showing your ignorance with your last statement. YOU have seen them let people in with fake medical cards?? How is this possible since it’s pretty obvious you would never even go near a dispensary! It is too easy to get a card, that I agree with, but it is certainly impossible to get INTO a dispensary without them calling your doctor the first time you go to a new place and then all that data gets put in their database. Like Frank said, millions of us voted FOR this, and people like me have legitimate medical reasons for MJ, stop denying our rights!! SD City Council = epic fail. Welcome to Ban Diego! Newer Article: I Wonder What a Gay Child Dreams?